Liz McCall has come to love managing her father's vintage toyshop, so when the Train and Toy Show comes to town, she's all aboard for a fun weekend. The only hitch is that her childhood bully/grownup business rival Craig McFadden has a booth next to hers. But the fun and games are over when Craig falls from the ceiling in a publicity stunt gone wrong. Liz is pulled into the case by her feelings for Ken, the police chief, and Jack, her high school sweetheart-whose brother is a prime suspect. But she's shocked to learn that her father may have been the intended target. 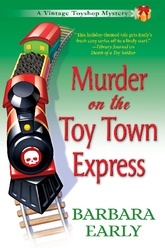 The trouble train is barreling down, and Liz may have bought a first-class ticket to an early grave in this delightful second Vintage Toyshop mystery.